We don't always remember our high school was named after one of the greatest athletes in history. 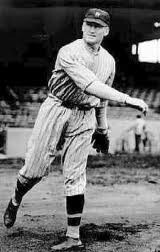 Walter Johnson played Major League Baseball for the Washington Senators for 21 years, from 1907 to 1927. Known as "The Big Train", he established many pitching records, some of which still stand today. The Big Train's profession certainly had an impact on our high school experience -- our yearbook was called The Windup and our newspaper was called The Pitch. Of course, both names are baseball terms. 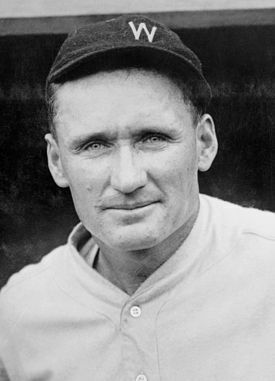 Click here to visit Walter Johnson's page on Wikipedia. NEW! The 1924 World Series is the only World Series won by a Washington team. It was a thrilling 7-game series. Walter Johnson had started and lost Games 1 and 5. In Game 7, on short rest, he was brought in to pitch in relief in the 9th inning with the game tied 3-3. He shut out the Giants for four innings and earned the win when the Senators scored in the bottom of the 12th inning for a 4-3 win. This was actually a great bookend for the series, since Washington had lost the first game 4-3 in 12 innings -- with WJ pitching all 12. To see rare footage of WJ pitching in the 1924 World Series, please click here.